Well I’m a little sad the weekend is almost over already, but really hoping for a better week next week. Last week was tough with hubby traveling for work, both of us catching a variety of the flu which hit poor hubby hard, work stress, etc. I’m thankful the week is over and we survived, what doesn’t kill you makes you stronger, right? 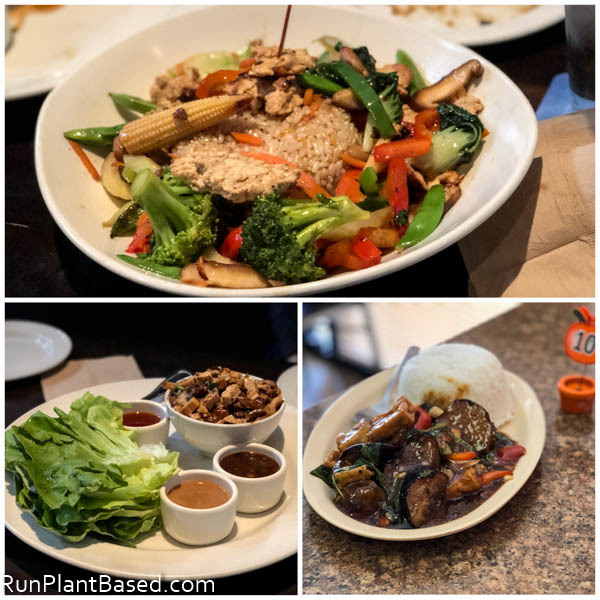 And I got to go to SacTown VegFest yesterday and some fun eating out too this week starting with Tofu Mushroom Lettuce Wraps and Gardein “Chicken” and rice bowl from Yard House to celebrate my sister’s birthday. And my favorite tofu eggplant dish from Pho Vegan Asian Cuisine for a nice lunch to escape work. I’ve been eating a lot of simple veggie meals at home like this curry chickpea saute with sweet potatoes and cauliflower. 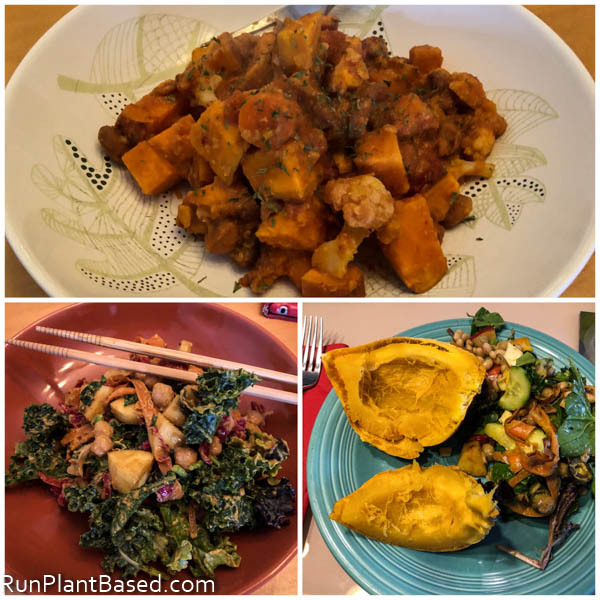 Salad and more salad with steamed acorn squash. We’ve also been trying more alternative, high-protein pasta. This week was Ancient Harvest Pow! Red Lentil Rotini. 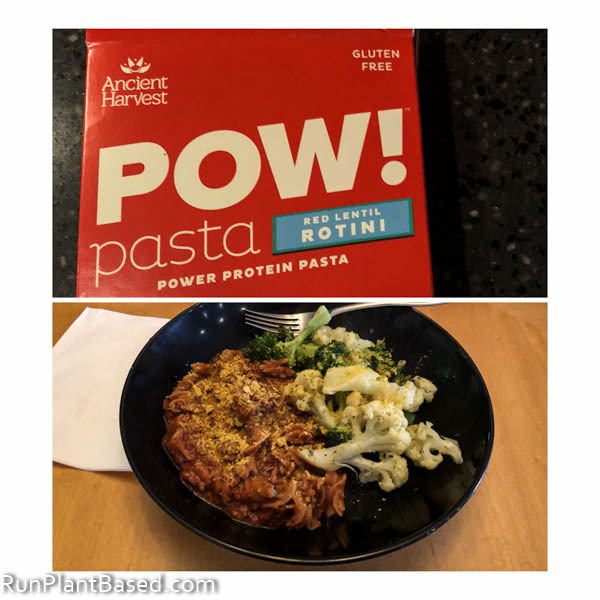 Thumbs up on the texture, not as chewy or “meaty” as edamame pasta can be and a fun way to get in more plant protein. 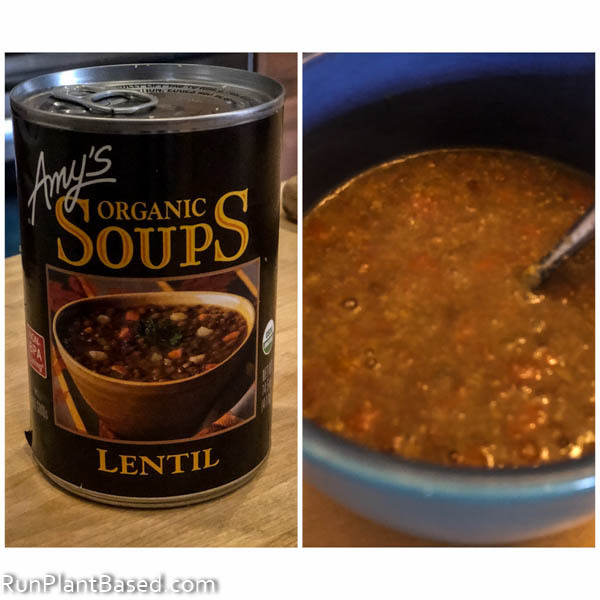 Thursday night I was feeling pretty wiped and crappy after a long day and just had Amy’s Organic Lentil soup with added nutritional yeast. Simple, but hearty and filling and a great pantry staple to have on hand when not feeling 100%. 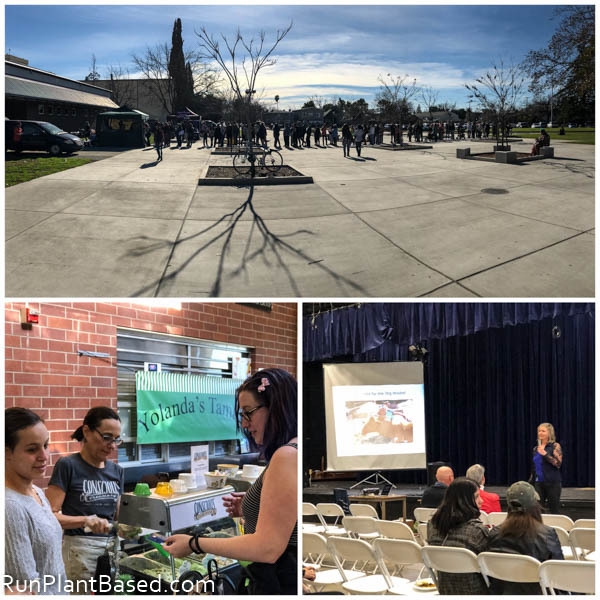 Thankfully I recovered in time for SacTown VegFest yesterday because I have been looking forward to this for months and helping to make the event happen with the Sacramento Vegetarian Society. This is the 3rd year since SVS took over the event and it keeps growing considerably each year which is so great. There were tons of volunteers and vendors this year and the layout and flow worked smoother. 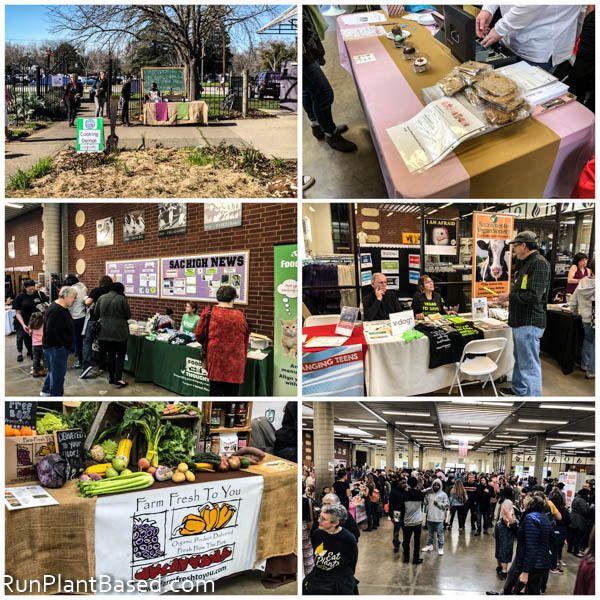 I went by myself since hubby was still not feeling great, but really enjoyed roaming all the booths, having lunch with new people, and connecting with friends from the vegan and vegetarian societies. The crowds amazed me, it seemed like a much bigger turnout. 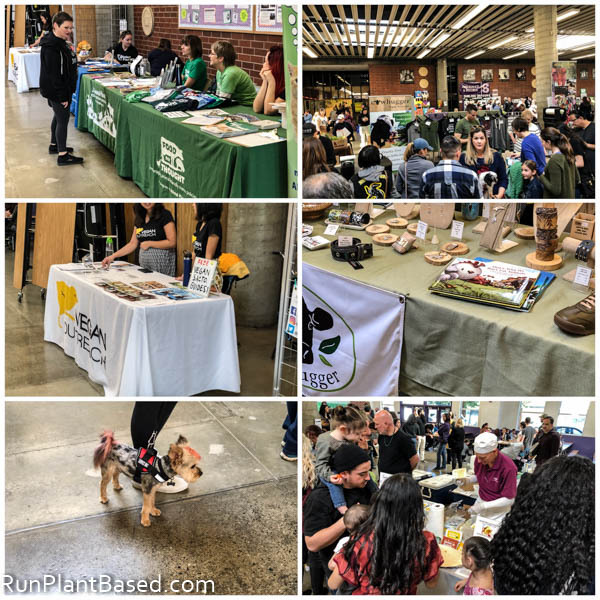 V-Dog with samples and Farm Fresh To You were back with essential oil booths, cosmetics, gardening, treats, and the food – oh the food! Lots of cute pups were also there, I could have spent hundreds at the Cowhugger booth easily and I always love chatting with Vegan Outreach representatives. That pic above is the line for the Southern Fried Vegan booth who ventured to Sacramento all the way from LA. All day the line was that long, even at the end of the event! I was tempted to wait it out, but too worried with my luck there would be nothing left by the time I made it to order! The food looked and sounded amazing through, vegan BBQ “beef”, mac n’ “cheese”, and other southern comfort options. Conscious Creamery and Yolanda’s Tamales were also crazy popular. Being mindful of how your plate affects your health. Appreciate the space between stimulus and response to understand, take a step back, and observe emotions to make better choices for reactivity. Practice mindful meditation to enjoy the present and company more and combat stress eating, mindless snacking, etc. Mindful practice provides better tools for dealing with life. Be mindful of excessive rumination that can lead to sadness, depression, obsession, etc. and something I tend to be guilty of! It was a great session and made me look forward to diving into the book. 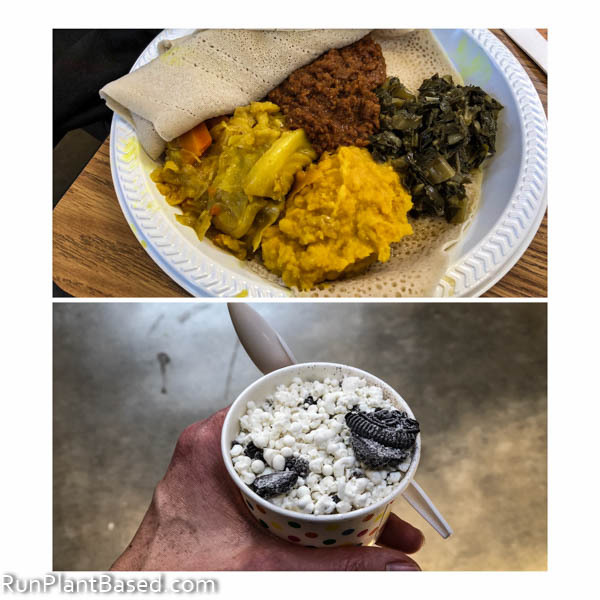 For lunch I went with once of my favorites that I rarely get to have – Ethiopian food from Abysinnia which offered great oil-free options this year. It’s hearty, spicy, but still light and full of whole ingredients. And I tried a crazy new dessert – Mini Drops IceCream in cookies and cream flavor. Instead of ice cream, it’s little hard frozen “drops” you can eat with a spoon. They seemed to stay cold much longer without melting and the unique format was fun. 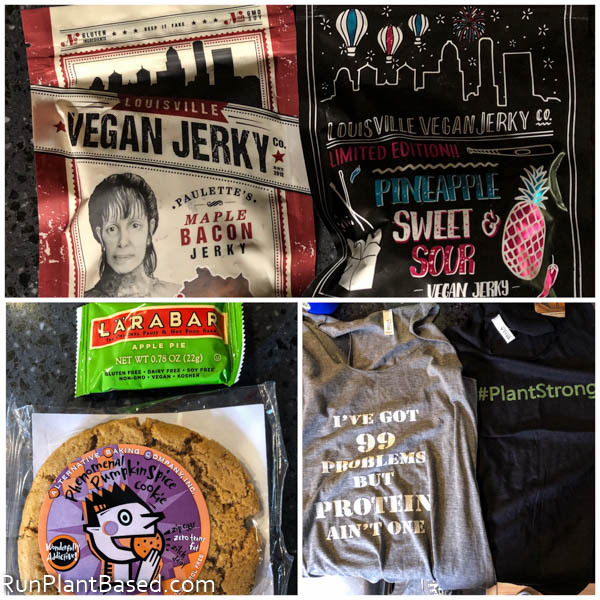 I came home with vegan treats, new vegan jerky’s to try, and two new gym tank tops to add to my massive collection. Kelly Slater is a vegan athlete now! James Cameron is inspiring more vegans. Liam Hemsworth rocking men’s vegan fashion. This Total Food Service article recommending offering more vegan options is encouraging. This avocado cake looks amazing. VegFest looks so fun! I would have tagged along with you if I lived any closer =) Sorry about getting the flu, both you and hubby, so NOT fun. It was, nice to get out and check out new things. Thanks on the flu, glad to be feeling better. I’m still bummed I missed you! So close yet still so far, right? You really captured all the highlights of the event so well. 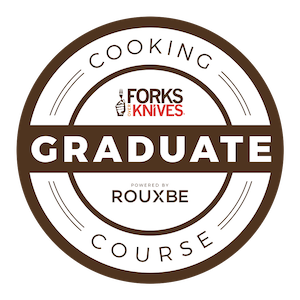 It was great to attend- And finally get a taste of those Mini Dots myself, too! I wish they could ship their products! Me too, such a bummer! Thanks, I bet you got way better pictures though. Yes, the mini dots were fun. This event seems like so much fun, Christine. It’s the first time I’m hearing that VegFest exists, so thanks for the enlightening post. Loved your pictures! Thanks, it was and so nice to see so many interested in the veg lifestyle.